Spencer Tracy. Katharine Hepburn. Gig Young. Joan Blondell. Comedy. Romance. Media/Journalism. Computers. Classics. 1950s. Hearing Impaired (DVD). Bunny Watson (Katharine Hepburn) heads up the research department at the Federal Broadcasting Company, a major TV network. Assigned by the network president to introduce computers into some of the department's functions, Richard Sumner (Spencer Tracy) arrives at Bunny's well-run division to observe daily activities. Unfortunately, however, Sumner is ordered to keep his mission secret. As a result, the whole staff believes they are being replaced. To make matters worse, there appears to be more than a little electricity between Bunny and Sumner, which upset's Bunny's boyfriend (Gig Young). 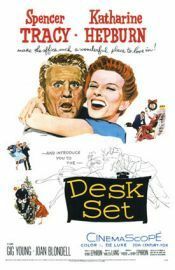 As tension in the office mounts, so do the laughs in this classic romantic comedy.